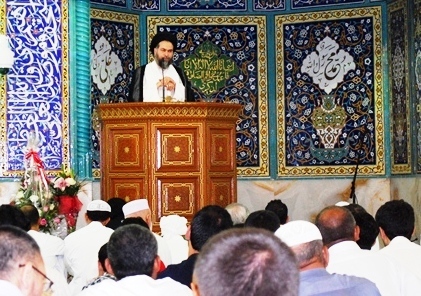 On Friday 10th August 2012, 21st Ramadhan, the Friday prayer was held by Ayatollah Madani in Imam Hussein (a.s) Mosque. In first sermon after Allah’s praise, encomium and reciting peace upon Mohammad (s.a) and his immaculate pure and chosen family and Imam Ali-ibn-Abitalib (a.s) suggest himself and the audiences to have Allah’s virtuous in all the daily life’s sides and instances. Then he continued with his weekly discussion about exemplary Shia and lessons of righteousness. He added “Today I’m going to explain all the virtuous lessons in one sentence, whatever you can identify Ali-Ibn-Abitalib (a.s) and try to make yourself closer similar to him.” He add that Ali-Ibn-Abitalib (a.s) is the leather and Imam of virtuous people and is the statue of virtuous and whatever has told about righteousness has realized by him. He told that as much as we know about him and become similar to him have been become closer to righteousness and those are alien to him are alien to righteousness. Then, he told his condolence to Imam Mahdi (aj) and the participants in the prayer for the disaster that happened in 21st of Ramadhan (Martyrdom of Ali-Ibn-Abitalib). He continued his speech about Ali-Ibn-Abitalib and narrated fromAbuzar Ghaffari. He mentioned this hadith has its documents among both Shia sources and Sunni brother’s sources. Abuzar Ghaffari narrated that I was sitting in a meeting that Prophet Muhammad (s.a) was there and prophet told” if you like to look at to Adam regarding his knowledge, or Noah regarding his understandings, or Abraham regarding his trait, or Muses regarding his worship, or Jesus regarding his journeys, or Ayoub regarding his patience just look at the one who is coming to us! And everybody turned his head to look who is coming and we saw Ali-Ibn-Abitalib entered the meeting. He continued that from Sunni brothers sources narrated that prophet Mohammad (P.B.U.H) told examine your kids by their love to Ali and Anas-Ibn-Malik has narrated that after Kheibar Battle Muslims used to take their children in front of Ali-Ibn-Abitalib and asking them if they love him or no to judge about their mettle as the pure mettle of kids might love the reality of Ali-Ibn-Abitalib. Ayatollah Madani then suggest to Ali-ibn-Abitalib Shia’s to be as similar as possible to him and prayed that Allah may gives everybody the luck of being close to him and as similarity as possible to him. Regarding the taboo bite he explained that worship which comes from the taboo bite is like building on water or dune. Ayatollah Madani added that it has narrated from our leathers to probe our Shia about their prayer time addiction and how keep the times. You have an Imam who used to pray one thousand rak’at in a day. So how should be our prayers? Shame on us that at the right time of prayer we are keeping ourselves busy in other things rather than prayer! He told that narrated that one of his accompaniers was passing through the palm of Bani-Naj’jar and heard somebody’s sorrow wail like a mother that lost her beloved baby. He went closer and saw that a man is praying and saying chant to Allah that “Oh, God of my lack of luggage, Oh God of hardness of the way… After a while because of severity of discomfort he got unconscious. I took his head on my lap and felt that his body got cold. I rushed toward Fatima (s.a)’s house and told her to come and take care of Ali, he passed away! She asked me where and I told there in Palm of Bani-Naj’jar and explained what happened there. She told no there is not his appointmet, and this is his daily manner of sorrow and prayer! At the end Ayatollah Madani prayed to Allah that” Oh Allah you are aware that we have no other hope but you, you may make our steps stable on love and supervision of Ali (a.s) and grant us the success of being the exemplary Shia in our and our family’s entire life. Oh Allah, support the Ali-Ibn-Abitalib (a.s)’s Shias all around the world and grant the victory to the Muslim nation. On second sermon, Ayatollah Madani had his speech in Arabic word for Arabic language prayers attending the Friday prayer.